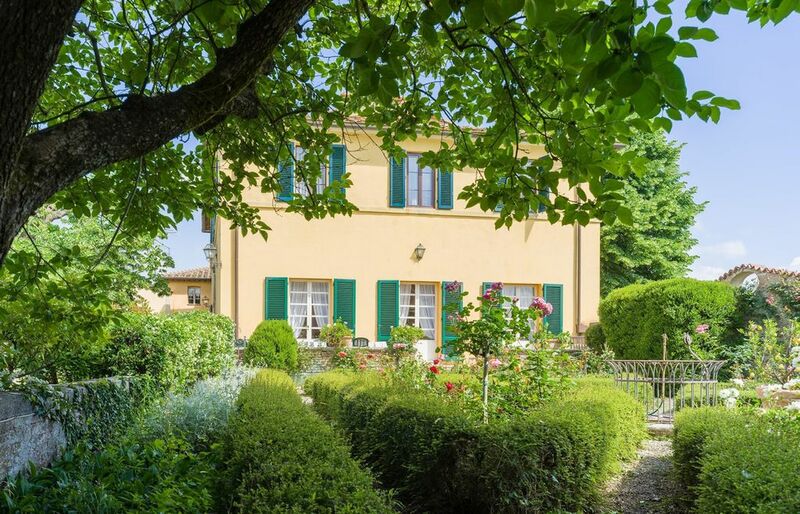 Villa Le Fate is a distinguished villa situated in the Sienese countryside, just 3 km (1.8 miles) from Siena, and immersed in the exquisite landscape of vines and olive groves. The villa is an old seventeenth century manor house which has recently been completely restored. The city of Siena stands out on the hill in front of the villa, providing a truly breathtaking view. The garden is undoubtedly a little piece of paradise. It is immaculately maintained and the charming rose bushes and lemon trees provide the backdrop for meals al fresco on the large terrace. There is also a good-size swimming pool surrounded by plenty of sun beds from where you can enjoy soak up some sunshine whilst admiring the panoramic view of the city in your own privacy. The villa even has its own little chapel, an exquisite building which makes a magical spot for holding weddings. This fully restored 17th century villa can accommodate up to 12 guests, making it an ideal location for a family or large group of friends. On entering the villa guests will be met with the grand hallway and living room, both perfect for receptions and parties. From here you pass to the dining room which can seat ten comfortably. The kitchen has a lovely countryside feel with additional dining tables and is fully-equipped with all you could need for self-catering including cooking equipment, crockery and cutlery. Conveniently there is also a utility room, second living room or study, bathroom and shower room on the ground floor. A marble staircase leads upstairs taking you to another large hallway. The five bedrooms can all be found on this floor- two bedrooms with queen-size beds, one bedroom with small double (French-size) bed and two twin bedrooms. There are also three further bathrooms on this floor, one of them an en suite to the master bedroom. This villa is very distinguished with its traditional style and smart antique furniture but it also has a truly welcoming feel which will instantly make guests feel at home.